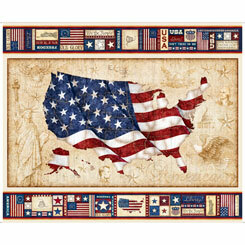 American Pride is a beautiful collection of patriotic fabrics by Dan Morris for QT Fabrics. A panel and 9 coordinating fabrics. Everything you need to complete the American Pride quilt. These fabrics feel so "rich" and sew beautifully. Available now at Oklee Quilting where you can get quality fabrics at reasonable prices.